Green Party leader and MP Elizabeth May, the Young Greens, and several Green Shadow Cabinet members are among the contributors to the latest Green Party of Canada newsletter. Here’s my contribution. Furthering GPC peace and security efforts has, for a few months, been combined with my volunteering full-time for Elizabeth in her parliamentary office. I joined Elizabeth’s Ottawa team when Parliament resumed in mid-September. 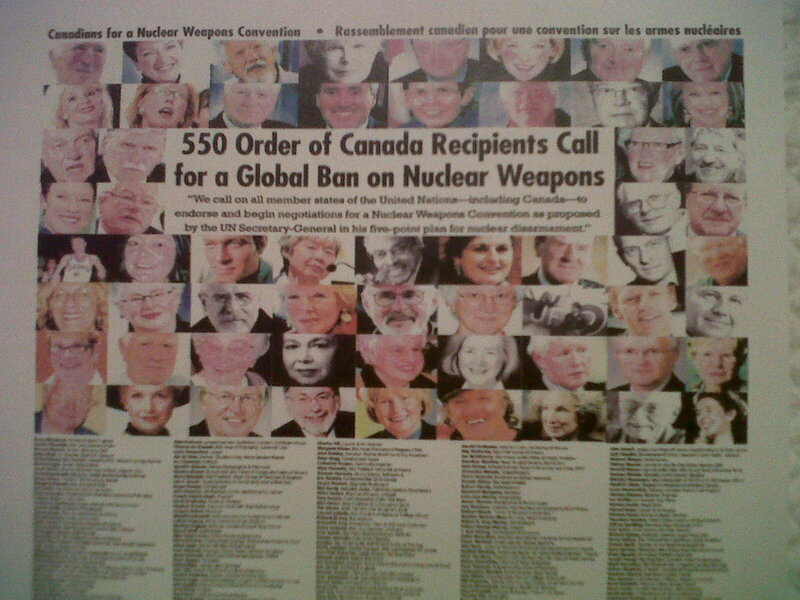 Elizabeth was one of the originators of the effort by more than 550 Order of Canada recipients that succeeded in having unanimous motions for nuclear arms control and disarmament passed in the Senate and in the House last year. Because Elizabeth was attending COP 17 in Durban, I represented her at a forum on Monday, December 5, in East Block, on how to further this effort. The organizers were Order of Canada recipients, and the other speakers were M.P.s. I delivered Elizabeth’s message that she’s keen to work with as many other parliamentarians as possible to re-activate the Canadian section of Parliamentarians for Nuclear Non-proliferation and Disarmament. The week before, I joined Elizabeth for one of the many press conferences at which she’s spoken. This one was on M.P. Alex Atamanenko’s Private Member’s bill to establish a Canadian Department of Peace, for which she was a seconder. A less formal activity: the Green Shadow Cabinet was represented well at the traditional All-Party Party, hosted by M.P.s and senators. On November 30, it was at the former railway station just down the street from Parliament Hill, now the Government Conference Centre. Everyone who works on The Hill was invited, and could bring one guest. I brought two: our Human Rights advocate, Joe Foster, and his guide dog, Fabray. Fabray made more new friends for the Green Party than did either Joe or I, and she dined extremely well! Because Elizabeth spends so much time in the House, her team enables her to keep up with other parliamentary business. On her behalf, I’ve been attending meetings of the Standing Committee on Foreign Affairs and International Development, its Subcommittee on International Human Rights, and the Standing Committee on Industry, Science and Technology. Two examples of the many issues explored, relevant to positions the Green Party has taken, are the situation in the Democratic Republic of Congo, and Canada’s role in international development. In Ottawa, I’ve been able to meet with a number of people active in NGOs. As well, I’ve been able to stay in touch with Green volunteers in Toronto who continue their valuable efforts on our Green Shadow Cabinet’s behalf. What I perforce could not do was continue my various volunteer commitments in Toronto. Before I left, when I contacted the folks in each group to explain, absolutely everyone responded with extraordinary enthusiasm about Elizabeth’s election and my opportunity to help her. Volunteering for Elizabeth on The Hill has been extremely rewarding. I’ve blogged a bit on my website. I’m keen to add more. The pace is so hectic, that will be after Parliament rises for the winter holidays, and I return to my home in Toronto. 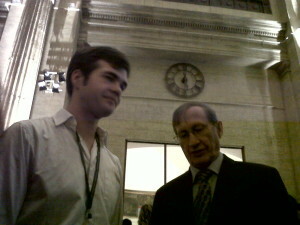 Pictured at the All-Party Party are Joshua McNeil, on the left, and Joe Foster, under the clock, in the former railway station, now the Government Conference Centre. Joe's giving his attention to Fabray, who couldn't fit into the photo. Canadians for a Nuclear Weapons Convention, a group of more than 550 Order of Canada recipients, sponsored a forum on Monday, December 5, to examine next steps after last year’s unanimous Senate and House of Commons resolutions on nuclear disarmament. Elizabeth, one of the Order of Canada recipients who led this initiative, could not participate in the forum, as she is now attending the COP 17 climate change talks. It was my honour to represent her, and a big challenge for me – most people there were Order of Canada recipients, and the other three speakers were M.P.s. The forum was in East Block. The guards there are friendly; if they aren’t too busy, they can sometimes be prevailed upon to open the door to Sir John A.’s office. Here’s what I said at the forum. Merci beaucoup – thank you all very much for welcoming me. It’s a great honour for me to be representing Elizabeth May, Canada’s first Green M.P., in this illustrious and important group. You all know I’m here because Elizabeth is in Durban. And you know how proud she is to have been, from the beginning, part of the group of Order of Canada recipients who worked so hard for the unanimous motions we are talking about this evening. The Green Party of Canada’s firm focus on nuclear arms control and disarmament comes from our 6 Green values. We share them with members of Green Parties around the world. démocratie participative et non-violence – participatory democracy & non-violence. Elizabeth is the main author of our Green Party of Canada’s major policy document. It’s called Vision Green. It’s full of details on our policies for healthy children, clean air and water, efficient public transportation, electoral reform, and much more. It’s available on our website. There’s a section called ‘Press for the elimination of all nuclear weapons’. That section begins by citing the expertise of the Hon. Douglas Roche, and some of the good company he is in. Our specific policies, in Vision Green and in our media releases (also available on our website), are congruent with the background brief circulated in preparation for this forum. We see the principles and particulars of the brief as absolutely fundamental, absolutely essential for all our other policies, just as our other policies are crucial for achieving disarmament. We believe fair treatment for all, and an end to poverty, are linked inextricably to – if I may say so at this season – peace on earth. I have two specific messages. Elizabeth, and all of us who work with her, are eager to help enable Canada to host preparatory meetings to generate political will for a nuclear weapons convention process. And of course Elizabeth is keen to work with as many other Parliamentarians as possible to re-activate the Canadian section of Parliamentarians for Nuclear Nonproliferation and Disarmament. You are all, I hope, fully aware of her constant willingness to cooperate on common goals. I heard her emphasize that just a few days ago, to the group in the ‘green room’ for the press theatre in Centre Block, right before the press conference on the bill to establish a Canadian Department of Peace, for which she was a seconder. In Parliamentary nuclear disarmament initiatives, she’s happy to play whatever role is desirable. 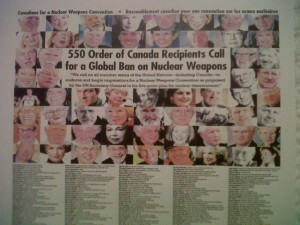 The photo doesn't show all the signatories' names that appear on the poster. You can see Elizabeth pictured - second from the top, second from the left.